I've published a few blog posts about Moms. The topic skirted around my motto that it doesn't matter who or what you're the Mom of...you're still a Mom. The word Mom isn't just applied to the human Moms who give physical birth to tiny human beings. Lisa and I are Dog Moms. We're real Moms. I know people who are Cat Moms, surrogate Moms, foster Moms, adoptive Moms, etc. And, when I say "etc" the list goes on and on and on. Over the past month, we got to witness another corner of Mom-hood. A few years ago, late Spring, Lisa and I were strolling through one of our favorite flea markets. We came across an elderly man selling handcrafted birdhouses. It was love at first sight. We purchased one of his birdhouses. For the time being, we displayed the birdhouse in our living room. We had every intention of returning to his vendor space in the Fall to purchase a few more for Christmas gifts. Sadly, when we returned that October, he wasn't there. 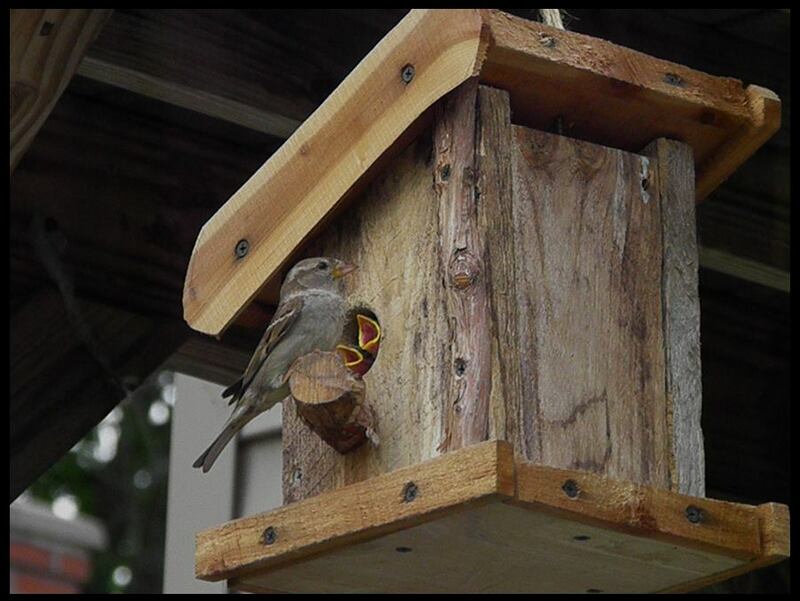 The birdhouse we originally purchased stayed inside. Within that time frame, we moved the birdhouse from the living room to the kitchen. Earlier this year, I mentioned hanging the bird feeder on our front porch. The last week of April, Lisa installed a sturdy hook and we hung it. Less than 2 days later, we had a tenant. A male and female house sparrow. They worked hard day in and day out building a nest. We watched them frequently working together. It was cool because this was our first birdhouse. Less than a month later, we knew there were babies inside. Every time Mama perched, the babies would make their baby-bird-chirping noises. It was loud. A few days later, this was the scene. Mama bird feasted on the seeds from the bird feeders we have in the front yard. 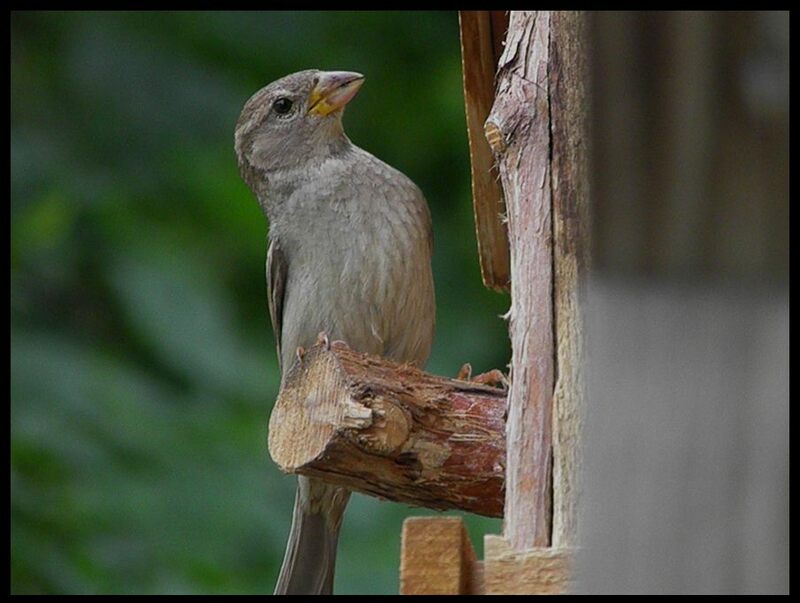 She'd immediately fly back to the birdhouse to feed her babies. I lost count how much time we spent outdoors watching. The entire process was quite amazing. We know the babies will fly away within a week. And, probably, this will happen when we're not out there to witness it. I'll be sad. 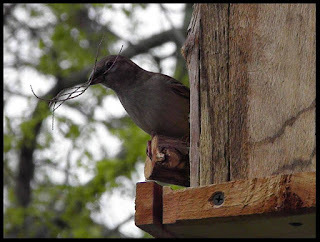 We've grown used to the baby chirps and watching Mama forage for food. I'm hoping we'll have another family after this one. Witnessing the entire process was nothing short of amazing. This entire experience has inspired us to hang more birdhouses. Since April, we've had plenty of opportunities to purchase more, but we're determined to make them ourselves. By Fall, we'd like to have at least a half dozen birdhouses hanging from the front porch.